Just as with any other part of the body, the skin of the arms can sag. This is the result of weight fluctuations or can be simply due to aging. Over time the skin begins to lose its elasticity and begins to sag. Unfortunately, no amount of exercise can tighten loose skin. The treatment is an arm lift, or brachioplasty. 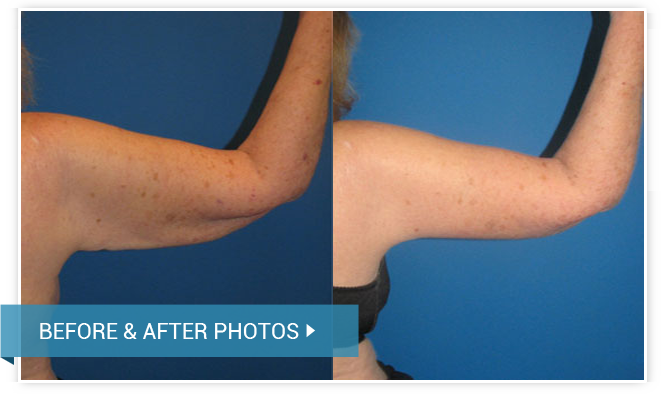 Dr. Dadvand performs the arm lift, or brachioplasty, to tighten the loose skin, giving you a more contoured arm. Depending on the amount and location of loose skin, Dr. Dadvand will perform either a traditional brachioplasty, or a mini-brachioplasty, or arm-lift. During a mini-brachioplasty or arm lift, the incision is made in the armpit only. This is for patients who have a lesser amount of loose skin that is closer to their armpit. A traditional brachioplasty, or arm lift, is performed when the loose skin is distributed over the length of the upper arm. The brachioplasty incision is placed along the inner aspect of the arm and is made only long enough to reduce the excess skin and fat. The operation is performed under general anesthesia and typically takes two to three hours to perform. After your brachioplasty, or arm-lift, you will be able to resume light exercise in about two weeks and full arm exercise at 4 weeks.